I fought it for quite some time. I actively avoided it. I didn't want any part of it. However, this past summer I knew that something had changed. I felt something I hadn't felt before. I convinced myself that it was nothing, probably just a phase. But after New Year's it became evident that it wasn't a phase at all, it was real. A few days later I came to terms with it. I just couldn't fight it anymore. Really my long aversion to coconut had a lot to do with its texture, you can always tell its there. In the same way that my mother does not want to chew her orange juice and I don't like crunchy things on my pizza (although I have recently started to enjoy onion); I have never liked coconut's inescapable chewiness in food. But I was given an awesome peanut butter dessert during the summer that included coconut and I kind of liked it. Coconut was also one of my favourite things about my New Year's carrot cake. However, when my friend presented me with a ridiculously large Ferrero gift bag (finally that friendship is paying off :)) the first thing I did was polish off copious amounts of Raffaellos. I knew then that there was no turning back. Oh the horror. Which brings me to this recipe, adapted from the awesome Baking: From My Home to Yours by Dorie Greenspan (one of the many Christmas spoils given to me by my parents). I was casually reading through it before bed one night when I flipped the page and was immediately drawn to this coconut “tea” cake and its description. I love everything about coffee cakes (I don't like tea :)). A good coffee cake should not be too light or heavy, not too sweet, not too rich, and not too moist or dry. Simply something to enjoy with a good cup of coffee. There could be no better recipe for my first coconut oriented dessert. 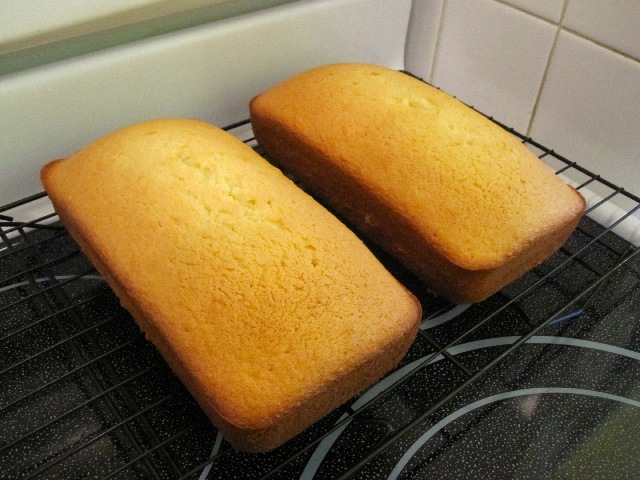 I didn't make many adjustments other than to reduce the sugar (it seemed like a bit much), and use loaf pans. I don't own a bundt pan, but have been meaning to pick one up. Honestly, what's one more speciality product in a sea of many? On a whim (and an attempt to be healthier) I also used fat reduced coconut milk, not realizing that this particular coconut milk had 68% less fat. That's quite a lot missing. So I was a little nervous about how the cake would turn out. I worried for nothing, the cake was moist with a texture that reminded me somewhat of a more dense angel food cake. It was also a little sweeter than expected, not overpowering, just more than I felt necessary, and to my surprise I was a bit disappointed with the coconut flavour. This may have something to do with the missing fat. However, my brother who loves coconut assured me that it tasted the way it should. And I would consider him somewhat of a coconut expert. What do I know? (Nothing). The “coconut chew” was not very noticeable, and for once I kind of wanted to notice. But this is a result of purchasing unsweetened medium coconut rather than shredded (which my grocery store never has). In the end all of these complaints are infinitesimally small and exist souly so I have something to complain about. The cake was excellent and most importantly paired well with a cup of coffee. I will definitely be making it again. I suppose I have entered a new stage in my life. It's time to accept who I am. I am a person that enjoys coconut. I should have known this would happen, it is a coco-”nut” after all. Granted, I'm not likely to give myself a concussion after opening a walnut with my head (don't do this), and I'm damned sure I have never milked a cashew. Preheat oven to 350F and grease 2 medium loaf pans (8 ½ x 4”), lining bottoms of pans with parchment paper, grease parchment paper. In a medium bowl combine flour, baking powder and salt and whisk to combine. In a medium saucepan set over medium heat, add coconut milk and butter. Heat until butter has melted and milk is hot to touch. Remove from heat, keeping mixture warm. In the large bowl of a stand mixer add eggs and sugar and beat on medium speed until mixture is thick and pale (approx. 3 minutes). Add vanilla and almond extract and continue to mix. Reduce mixer speed to low and slowly add dry ingredients until just combined, scraping down the bowl as necessary. Slowly add coconut until just combined. With the mixer still on low, slowly add coconut milk mixture until batter is smooth. Evenly pour batter into prepared pans and bake on centre rack for 45-50 minutes, or until toothpick comes out clean (this took me 45 minutes). I would have to say the eating eraser shedding feeling is the reason I distrust said co-co nut.